I created this mini quilt, which I've named Twenty Shades of Pink, for the Quilt Alliance's TWENTY 2013 Quilt Contest, Exhibition, and Auction. The theme of the challenge was really broad; basically, you could create anything that celebrates "twenty:" the numeral, the concept, the quantity, the word, etc. 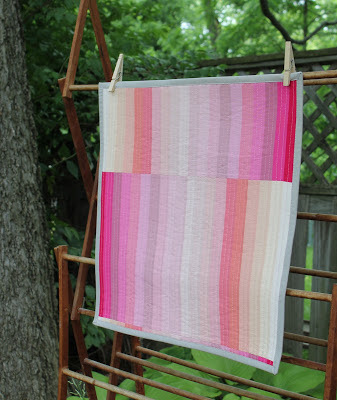 It probably comes as no surprise that I would choose a simple approach to this task, so I used twenty different shades (technically speaking, hues) of pink solid cotton fabric, ranging from pale pink to deep fuchsia. I arranged the colors so that they were in order from dark to light, and then back to dark and light again, giving the quilt a bit of an ombre effect. I sewed the twenty fabric strips together and then I cut the pieced section into three segments of varying widths, which I then rearranged and sewed back together. The quilt measures 20 inches square in accordance with the guidelines of the challenge. 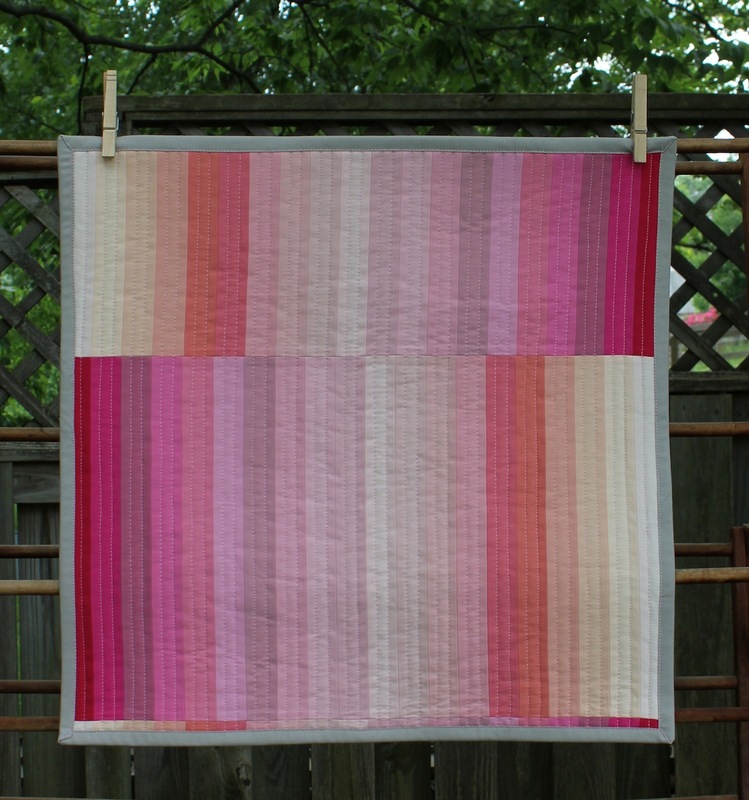 I machine quilted it with straight lines of stitches in pink cotton quilting thread. And I used a solid light gray cotton for the binding and backing, which I thought worked well and didn't compete with all of the pinks. 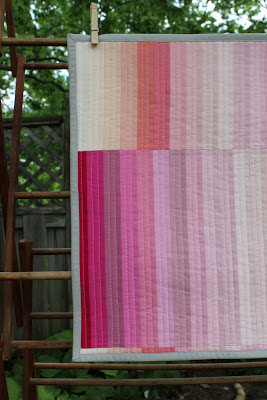 My favorite part of this quilt is that little strip of patchwork at the bottom. I love it, and I think it really makes the design, if I do say so myself. Twenty Shades of Pink will be on display at the Original Sewing & Quilt Expo in Paducah later this year, as well as some other venues, and it will be auctioned off as a benefit for the Quilt Alliance. I'll keep you posted on the auction as it gets closer.